As you may already guess Egyptian Rise for a theme uses one of the most exploited and most used themes in the online gambling industry, Ancient Egypt. Video slot games and Ancient Egypt seem to be connected in some mystic way, as big payouts are almost always connected to the great riches of Egypt. You can find a very big number of video slot games online that use this same theme, each one adding its own share of originality in design. 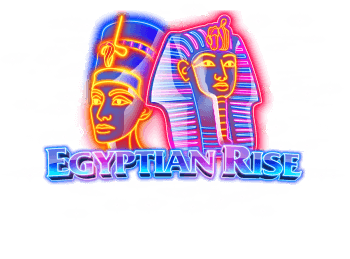 Even though the Ancient Egypt theme can be found in every software provider, Egyptian Rise is probably the first Egyptian theme slot game, which combines the ancient mystic with modern day looks. If you take a closer look you will see that the classic symbols like pharaoh, scarab, cat are designed in bright neon light making them very modern and fancy. This is not something you would expect to see on a video slot game with an ancient theme, but we guess there’s a first time for everything. Either way the symbols design, along with the overall game appearance is attractive and interesting, adding a dose of refreshment to a déjà vu theme. Egyptian Rise is the latest project we had a chance to try out for real play, coming from NextGen Gaming. This is a really great provider which has a very big offer of video slot games and they are constantly working hard on increasing that number. If you are a loyal fan of NextGen slots you might see the similarity between Egyptian Rise and Wolfpack Pays, which was released a few months ago. Everything is the same except for the theme and symbols used, while the bonus features and design is identical. Egyptian Rise has a modern 243 ways to win design, with the expected 5 reels and 3 rows on the screen. The bets on Egyptian Rise can go from the $0.40 minimum up to the $80 per spin maximum. The bet level can be easily manipulated, while the ways to win number is fixed. If you like long sessions, you can always use the installed Auto Play button. Just like in Wolfpack Pays, Egyptian Rise uses the identical consecutive wins design in order to trigger the bonus feature. The main accent in this game is set on the consecutive wins and the wild Scarab symbol. Each win that happens on the reels, will award a re-spin free of cost. In that re-spin a wild symbol can land on reel 3 only and help to form another win. If another winning spin happens, another re-spin is awarded, but here the wilds can land on reels 2, 3 and 4, increasing the chance for another winning spin to happen. If a third consecutive win lands on the reels, the wilds can land on all of the reels. If a fourth consecutive win is formed, the On a roll feature ends and the free spins bonus is awarded, while all wilds are reset. This is called the Pharaoh feature in which the player has an unlimited number of free spins and a total of 5 wild scarabs are added to the reels. But the catch in this feature is that it ends once 3 nonwinning spins land on the reels. This ends the Pharaoh feature and resets the wilds to zero, so you start again. Egyptian Rise can award decent payouts on the reels, thanks to a few crucial factors. First, the 243 ways to win design allows for winning combinations to be formed easier. This combined with the unlimited number of free spins and added wilds to the reels can create payouts of over 1,000 x total bet and more. Egyptian Rise is a great combination between the old and the new and is the perfect example of what a capable team of designers can achieve with a given theme. The entire game concept is interesting with a solid free spins bonus round. The unlimited number of free spins available and the extra wilds that can land across all reels are very attractive, but due to the variance big payouts can be hard to land. Also the symbols payout is not too impressive for our taste, resulting in small and very rare medium wins on the reels.